The Percusys® screw-rod-system is a multi-functional implant for spinal stabilization procedures. Depending on the individual situation it can be used percutaneously or in an open method. For an optional cement application the screws are cannulated and perforated. Additionally, a variety of implant designs for different indications is available. The preassembled set screw inside of the characteristic lengthening shaft allows an effective and quick surgery. 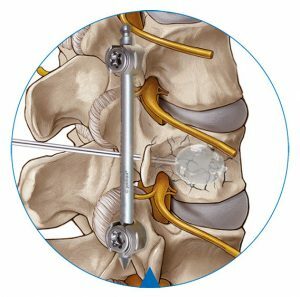 Depending on the anatomy of the vertebrae and surgical indications, different screw types with various diameters and lenghts can be chosen. In addition, lordotic and straight rods in different dimensions are available.